Free shipping. Buy direct from HP. 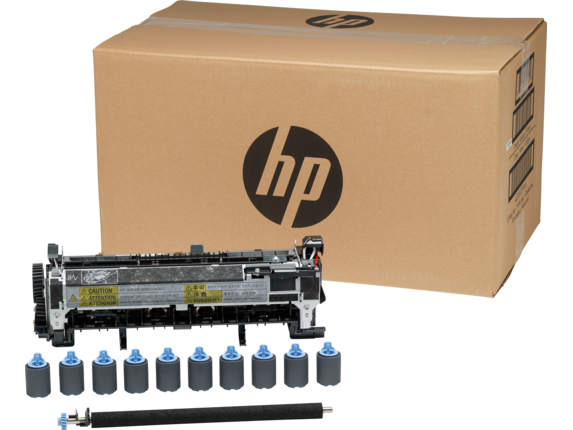 See customer reviews and comparisons for the HP LaserJet CF064A 110V Maintenance Kit. Upgrades and savings on select products. When you’ve got an HP LaserJet printer, there are very precise maintenance details that should be properly managed to ensure smooth printer operation. With the help of the HP LaserJet cf064a 110v maintenance kit, HP LaserJet owners can care for their printers without ever needing to take it into a repair shop. That’s right, you can harness the power of printer fixing within the walls of your own home or office. Efficiency is key with all of these printers, which means speed and quality are of the essence. Instead of simply hoping your printer maintains its expeditious nature, make it a given by performing regular upkeep procedures with the HP LaserJet maintenance kit cf064a 110v. Looking for more HP accessories? We’ve got you covered. Ever wondered why your paper is warm to the touch when it’s freshly printed? The fuser unit is made up of a pair of heated rollers which are responsible for melting toner into paper to recreate your various desired images. Heat and pressure application are necessary for proper printing execution. And after all, you depend on your printer’s accuracy for professional-grade prints. Although the integrated fuser technology is among the smartest on the printer market, fusers need to be replaced every so often to keep your printer running in tip-top shape. Over time, dust particles tend to latch onto parts of the printer which can slow the working process. It’s typical for printer performance to diminish over time, but regular care and timely replacements can keep your HP LaserJet in order for a long time to come. Unlike inkjet printers, HP’s LaserJet printers use electrically charged toner to create gorgeous color images and crisp black and white documents. This grain-like ink material is applied much more liberally to paper than traditional ink, giving you faster print speeds than an ink printer could offer. Known for our long-lasting, high-tech products, HP® is the proud manufacturer to market-leading printers that stand the test of time. With the HP LaserJet CF249A 110V Maintenance/Fuser Kit, we put the power in your hands to make the most of your HP LaserJet printer. The included installation guide makes following the step by step replacement process simple enough for novices. Whether you need a primed and perfect kit to repair your printer or want to better your office setup with our printer accessories, HP® has it all.